Ariel is a devoted labrador. Named after the title character in Disney’s “The Little Mermaid,” Ariel can’t get enough of her user, 37-year-old Kanako Suzuki. Ariel rolls on her back, begging to be petted, and when Suzuki joins her on the floor, the animal jumps onto her lap — all 24 kilograms of her. The 3-year-old labrador looks a little lost when her user leaves the room for a minute, but becomes animated again when Suzuki reappears. However, Ariel’s demeanor changes as soon as Suzuki moves toward the entrance. The animal’s face takes on a serious disposition and she stands as if at attention while waiting for her owner to put on her harness. Once the harness has been fitted, Ariel is ready to start work — as a guide dog. Suzuki, a trombonist and teacher, was born with poor vision and could see reasonably well until she was in college. She lost her sight gradually, at first thinking that she was just tired. Over the course of a year or two, her vision began to worsen until she eventually couldn’t see anything at all. About two years later, Suzuki stumbled across a blog written by someone who used a guide dog and likened the experience to “being able to walk fast enough to feel the wind.” Suzuki wanted to experience the same thing and so she started to look into finding such a companion. Suzuki spent a year learning how to use a long cane after discovering that it was an essential part of the process and, finally, submitted an application to receive an animal. She was on a waiting list for three years before getting her first guide dog, Nancy, in 2008. Although dogs have lived alongside humans for centuries, the first recognized training system for guide dogs was established 101 years ago in Oldenburg, Germany. In August 1916, German doctor Gerhard Stalling opened the world’s first guide dog training school after treating soldiers who had been blinded or visually impaired during World War I. The guide dogs were soon exported to other countries, including the United States, Britain, France, Spain and Italy. And in 1939, four German shepherds were sent to Japan to assist visually impaired soldiers. World War II prevented guide dog training from taking off immediately in Japan but, in 1957, a German shepherd named Champy became the first domestically trained service animal. As of March this year, there were 951 guide dogs working in Japan. Although German shepherds were the main breed 100 years ago, most guide dogs in Japan these days are labradors, golden retrievers or a mix of the two. Internationally, in addition to German shepherds, there are other types of guide dogs, including dalmatians, dobermans and even a hybrid breed called labradoodles. 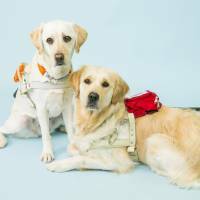 Mika Anbo, a staff member of the Promotion and Education Department of the Japan Guide Dog Association, says that labradors and golden retrievers are typically believed to be the most suitable breeds to handle the responsibilities that come with being a guide dog in Japan. That said, the organization is open to trying out new breeds. Established in 1967, the Japan Guide Dog Association is one of 11 independent organizations in Japan that breed and train guide dogs. On average, the organizations train about 130-140 guide dogs a year, but more than 60 percent of them go to users who need to replace their current animals. 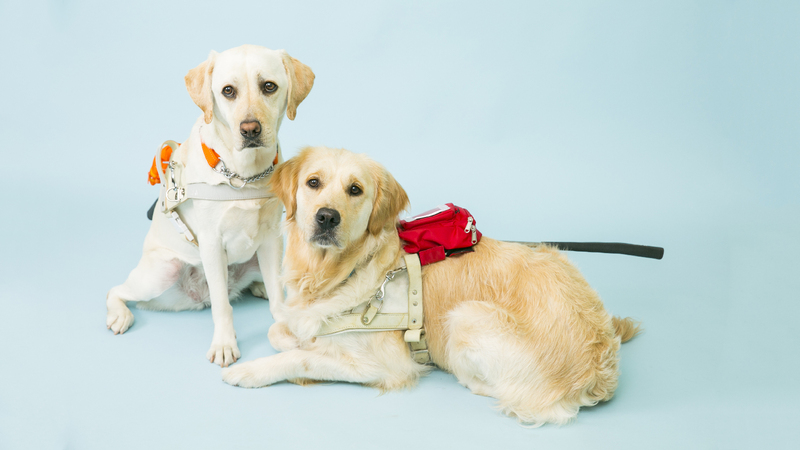 Data compiled by the organization, meanwhile, show that there are about 3,000 people who have expressed an interest in starting to use a guide dog, more than triple the number of existing users. Compared to overseas, the number of guide dogs in Japan remains very small. According to the International Guide Dog Federation, with 92 member organizations in more than 30 countries worldwide, about 10,000 guide dogs are registered in the United States, with approximately 4,700 animals in Britain and about 1,500 in Germany. 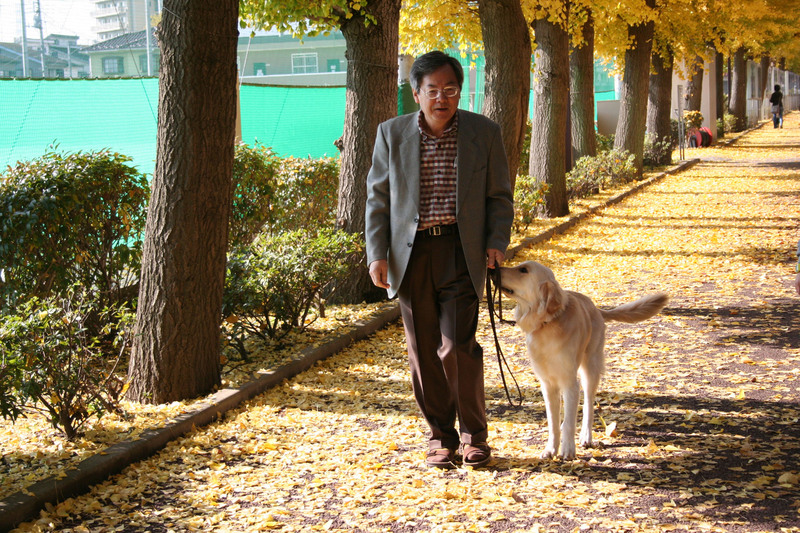 Mitsuaki Ohta, a professor of animal-facilitated therapy at Tokyo University of Agriculture, says many urban areas haven’t been designed with guide dogs in mind. Guide dogs were included in legislation for the first time in a 1978 revision of the Road Traffic Law stipulating that visually impaired people must either carry a long cane or be accompanied by a service animal in public spaces. Since then, the government has asked public institutions such as hotels and restaurants to accept visitors with guide dogs. Such requests, however, were not initially legally binding. In 2002, the government ratified a law on assistance dogs for people with physical disabilities, which both grants people with guide dogs the right of entry to public facilities and outlines the obligations that dog users must follow. The law does not include any penalties. Anbo of the Japan Guide Dog Association says that guide dog users regularly file complaints after being barred from entering restaurants, apartments or other establishments. She says that it’s important to convince such places to understand the issue from the perspective of a guide dog user. Despite the legislation, tragic accidents do occur. In August last year and January this year, men with guide dogs fell off train platforms in separate incidents and were killed. Neither station had installed platform doors. Guide dog users and experts stress the importance of these doors to prevent such accidents from happening in the future. Anbo says train stations are extremely disorientating for those who have a visual impairment and encourages members of the public to ask if such a person looks like they may need assistance. The Japan Guide Dog Association has outlined a list of criteria that potential users of guide dogs must satisfy. Anyone wishing to adopt a guide dog must be 18 years old or older, and must be physically strong enough to do things such as exercise and wash the animal. A user’s accommodation must be large enough to create an area that’s big enough for a guide dog to sleep in. The guide dogs are lent to users. 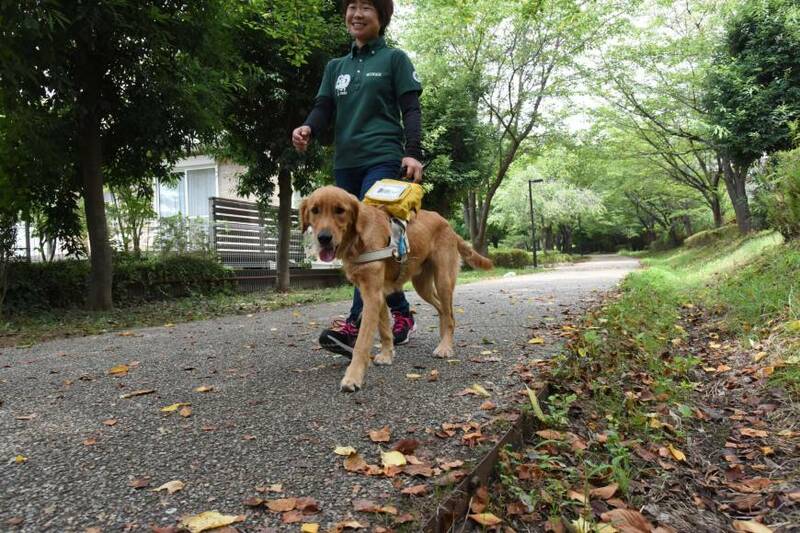 Costs depend on each organization, but at the Japan Guide Dog Association, which receives about 94 percent of its funding from donations, users are only asked to pay for daily ongoing expenses such as dog food and trips to the vet. To ensure the welfare of the dogs and their users,, the organization schedules regular follow-up visits, and it has set up a hotline for owners in case they face any difficulties. In 2012 and 2014, reports appeared in the news about cases of alleged guide-dog abuse, although none of these cases were related to the Japan Guide Dog Association. Anbo says the association has seen cases where users were unable to take proper care of the animals, although no cases of physical abuse have been recorded. “We make sure the dogs are treated properly by holding follow-up visits and, although it is extremely rare, we can ask users to return an animal if the environment it is placed in is poor and does not improve,” Anbo says. Ohta, an expert in the relationship between people and animals, dismisses such allegations outright. With advances being made in technology, some have proposed that robots or high-tech canes be used instead of guide dogs. While Ohta agrees that such products would be fine in terms of helping visually impaired people get around, he adds that they do not possess the advantages of living with an animal. So how does a regular canine become a guide dog? The Japan Guide Dog Association has four centers in Japan, with facilities in Kanagawa, Miyagi, Shizuoka and Shimane prefectures. Born from healthy breeding dogs, the puppies spend the first couple of months with their mother and siblings. After turning 2 months old, they are placed in a private home until they are a year old with a volunteer called a “puppy walker.” This is an important process, says Naoko Shimada, a 10-year veteran trainer at the Japan Guide Dog Association, noting that the dogs at this stage are effectively learning to live in society. Once the dogs turn 1, they’re brought back to one of the four centers, where they spend another year or so being trained and evaluated as a guide dog. Guide dogs are required to carry out three basic tasks: alerting users whenever they approach a corner, curbs or barriers. Shimada demonstrates part of a training session with a male golden retriever who is 16 months old. When they reach a flight of stairs, the animal stops about 5 centimeters away from the edge. “Good,” Shimada tells the dog. 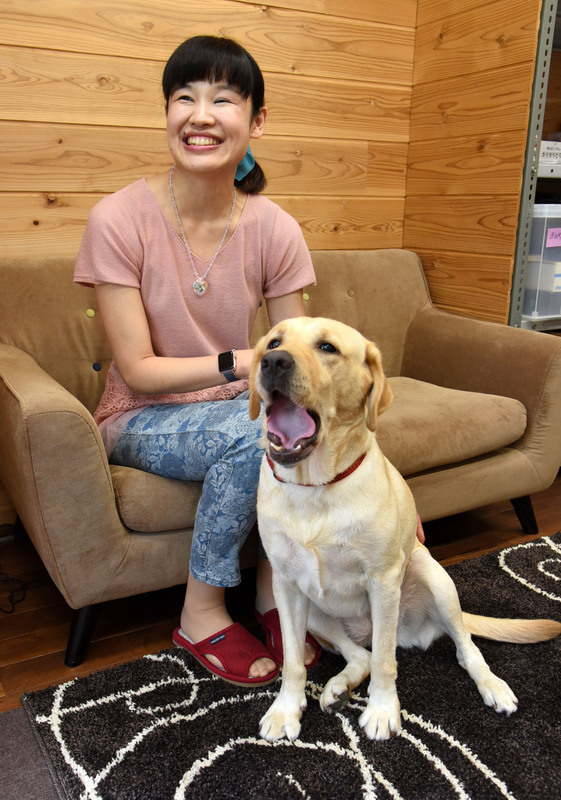 Shimada says 30-40 percent of candidates ultimately make the cut and become guide dogs, working about seven to eight years before they retire. Not only do the dogs need to be physically healthy and have good eyesight, they can’t get rattled by loud noises and must enjoy being around people. If a dog fails to become a guide, it could do such things as become a “PR dog” for the organization, accompanying employees from the Japan Guide Dog Association as they travel around the country teaching the general public about guide dogs. Others, including retired guide dogs, become pets. Once a dog passes the year-long training program, it is paired with a user. At this stage, adjustment training begins. 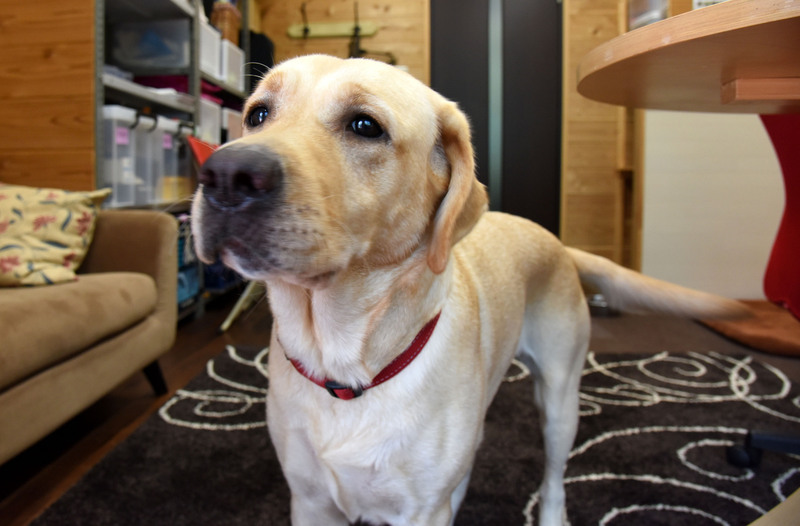 At the Japan Guide Dog Association, new users stay with the dogs at the center to simulate life at home and prepare them for their new lives. 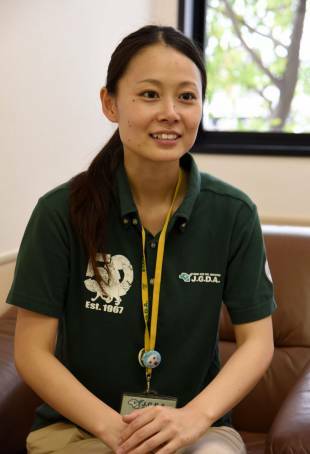 Shimada says a very important part of her job is not only to train the animals but to ensure the transition is seamless for the dogs and their new users. She is also a mobility instructor helping people who are visually impaired learn to utilize guide dogs. Instructors usually spend about a month with new users. New users spend 2½ weeks or so sleeping at the center, being taught how to care for their dogs and going over the basics of feeding, grooming and cleaning. When Suzuki received her first guide dog, Nancy, in 2008, she stayed at one of the Japan Guide Dog Association’s centers for 2½ weeks. There she learned how to take care of Nancy, how to work with her and how to bond together. In the last week and a half of the training program, they moved in to Suzuki’s house and an instructor would come and help the two adjust inside her home. The instructor would also accompany the pair to places Suzuki often visited. Having Nancy changed Suzuki’s life. Nancy stayed with Suzuki for 7½ years and the pair went everywhere together, from shopping and lunches with friends to visiting DisneySea. On Feb. 22, 2016, it was time for them to part ways — Nancy was retiring from her role as a guide dog. Suzuki made sure she didn’t cry in front of Nancy when she was being led away, so that her canine friend didn’t become distressed, and only shed tears once she had said goodbye. However, Suzuki didn’t have much time to be sad because the Japan Guide Dog Association had already lined up Nancy’s replacement, delivering Ariel just two hours later. And with that, the story continues.